Leftist Costa Rica outsider leads election, run-off expected. Luis Guillermo Solis: "From coast to coast, the rising wave has become a great tsunami that has washed away traditional politics forever..."
(Reuters) - A left-leaning former diplomat edged ahead in Costa Rica's presidential election on Sunday, riding a wave of disgust at government corruption to get within reach of wresting power from the centrist government in an April run-off. 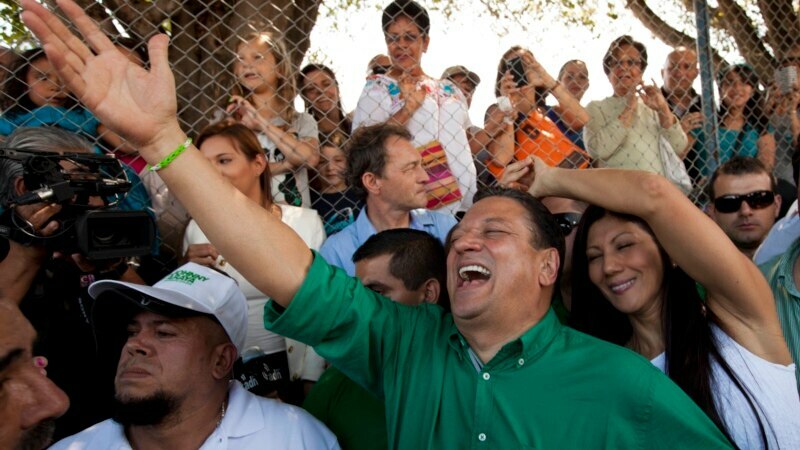 Luis Guillermo Solis, an academic who has never been elected to office, had a slim lead over ruling party candidate Johnny Araya despite trailing in pre-election polls and early vote returns. Araya was seen as the front-runner ahead of the vote, but his campaign was hurt by corruption scandals that plagued President Laura Chinchilla's administration. Solis, who ran on an anti-corruption ticket, won 30.9 percent support on Sunday compared to 29.6 percent for Araya with returns in from around 82 percent of polling centers. Left-wing lawmaker Jose Maria Villalta was in third place with 17.2 percent. His supporters could help carry Solis to victory in the run-off against Araya, although votes from a host of smaller parties who commanded around a quarter of the tally on Sunday will also be fought over. A Solis victory in the run-off would mark another triumph for center-left parties which have gained ground in much of Latin America in recent years. "Costa Rica's time has come," Solis said with a wry expression as his supporters cheered to the blare of music on Sunday night. "From coast to coast, the rising wave has become a great tsunami that has washed away traditional politics forever. Araya, 56, promised to reduce poverty and painted his leftist rivals as radicals who are a threat to Central America's second-largest economy. "We represent the safe road, the responsible road, to maintain political, economic and social stability in Costa Rica," Araya told flag-waving supporters of his National Liberation Party after vote returns showed him losing his early lead. Voter anger over government corruption buoyed his left-leaning rivals, who also promised to tackle inequality in the coffee-producing nation. Gaffes during the campaign, such as underestimating the price of milk in an interview, distanced Araya from some voters. A prosecutor's probe into allegations of abuse of authority and embezzlement while Araya was mayor of San Jose also dampened his appeal. Solis, who cut his teeth working in Costa Rica's foreign ministry, surged late in the campaign by pledging to improve infrastructure, overhaul the country's universal health care provider and stamp out corruption. "The National Liberation Party has been in power for eight years, and if it has stood out for anything, it has been its extreme corruption," said Eduardo Solano, 23, a union legal advisor. SAN SALVADOR (Reuters) - A former left-wing guerrilla commander took a strong early lead in El Salvador's presidential vote on Sunday over a conservative rival who wants to send the army in to fight powerful street gangs, but could face a run-off, early results showed. SAN SALVADOR (Reuters) - A former left-wing guerrilla commander had a strong lead in El Salvador's presidential election on Sunday and heads into a run-off vote well positioned to defeat a conservative rival who wants to fight powerful street gangs with the army. GEORGE TOWN, Cayman Islands (Reuters) - A 30-foot (9 meter) sailboat with about 30 Cuban refugees aboard docked in the Cayman Islands on Sunday and passengers said they were hoping to reach Honduras. SYDNEY (Reuters) - A fisherman from El Salvador who washed ashore on the Marshall Islands said he survived more than a year adrift in the Pacific Ocean, drinking turtle blood and catching fish and birds with his bare hands. SAN SALVADOR (Reuters) - A former left-wing guerrilla commander and a conservative rival who wants to use the army to fight powerful street gangs faced off in El Salvador's presidential election on Sunday. SAN JOSE (Reuters) - Costa Rica's centrist ruling party hopeful Johnny Araya had a strong early lead in Sunday's presidential contest, but could still face a run-off, preliminary election results showed. SAN JOSE (Reuters) - Costa Rica's centrist ruling party candidate Johnny Araya took an early lead in Sunday's presidential election but looked on course to face a run-off after a late surge from a left-leaning rival, partial results showed. MOSCOW (Reuters) - A Moscow high-school student shot a teacher and a police officer dead and held more than 20 other students hostage in a classroom on Monday before he was disarmed and detained, police said, just days before Russia hosts the Winter Olympics. SAN JOSE (Reuters) - Costa Rica's centrist ruling party candidate Johnny Araya took a slight early lead in Sunday's presidential election and was on course to face a tough run-off after a strong showing by two leftist parties, partial results showed. SAN JOSE (Reuters) - As voters streamed to the polls on Sunday, Costa Rica's centrist ruling party front-runner hoped to fend off a leftist surge fueled by resentment over corruption scandals and rising inequality. SAN JOSE (Reuters) - A left-leaning former diplomat edged ahead in Costa Rica's presidential election on Sunday, riding a wave of disgust at government corruption to get within reach of wresting power from the centrist government in an April run-off. SAN SALVADOR (Reuters) - A former Marxist guerrilla leader is in a strong position to win El Salvador's presidential election in a run-off against his right-wing rival after falling just shy of an outright win in the first round of voting on Sunday. SAN SALVADOR (Reuters) - A former left-wing guerrilla leader took a strong early lead in El Salvador's presidential election on Sunday, early results showed, but he could still face a run-off against a conservative rival who wants to deploy the army to fight powerful street gangs. Puerto Rico Governor Alejandro Garcia Padilla has signed an order establishing a new advisory commission on the construction industry. The nine-member commission will work with the private sector on the “socioeconomic impact analysis of public policy decisions, laws and regulations” that affect the industry, according to a release from Padilla’s office. Padilla made the announcement during a the swearing in and inauguration of the new board of directors of the Association of General Contractors of America. The Governor said the commission would help with the “flow” of dialogue and help to develop consensus among the main components of the industry and their related governmental entities. Garcia said he would also be working to extend the programme to encourage the purchase of new homes and the creation of a new grant programme for families without homes to acquire “social housing,” among other initiatives. El gobernador Alejandro García Padilla decretó el domingo tres días de duelo en el país, tras el fallecimiento del actor y comediante puertorriqueño Luis Raúl Martínez Rodríguez. “Luis Raúl, además de ser un extraordinario actor y comediante, era un gran puertorriqueño, con un amor profundo por su pueblo. A su familia, un sincero abrazo, con la confianza de que Dios les brindará consuelo ante esta inesperada perdida. Wilma y yo levantamos una oración por su eterno descanso”, declaró el primer ejecutivo en declaraciones escritas. Durante los tres días de duelo, que comienzan el lunes, 3 de febrero, las banderas ondearán a media asta en todas las dependencias públicas. Martínez falleció en la madrugada del domingo luego de casi tres semanas de sufrir de una condición respiratoria que lo mantuvo varios días conectado a un respirador artificial. Tenía 51 años al momento de fallecer. La protesta se escenificó en las inmediaciones del Hotel Venetur Margarita, ubicado en el sector Costa Azul de la ciudad balneario de Porlamar, constató la prensa local. Con diversas pancartas en las que abundaban los lemas políticos, la concentración solo pudo llegar a unos 100 metros de la entrada al hotel, pues un anillo de seguridad de la Guardia Nacional, conjuntamente con la policía del estado insular Nueva Esparta, impidió que los manifestantes pudieran acercarse más. En lo que fue una protesta presuntamente convocada por sectores de oposición, abundaron las consignas y golpes a láminas de zinc de una construcción cercana, que provocaron mucho ruido. Autoridades de la policía y la Guardia Nacional de Nueva Esparta, consultadas por The Associated Press, declinaron formular algún comentario. El presidente venezolano Nicolás Maduro pidió castigo para los manifestantes, al considerar que agredieron a los miembros del Equipo Villa Clara de Cuba. "No va a haber debilidad frente al fascismo, llamo al castigo más severo contra este grupo que agredió a los deportistas. Llamo a Venezuela y al pueblo de Margarita a repudiar estos actos", dijo Maduro en declaraciones difundidas por estatal Venezolana de Televisión, sin dar detalles. Horas antes, el ministro para el Turismo, Andrés Izarra, condenó la protesta a través de su cuenta en la red social de Twitter. "Un grupo fascista busca sabotear la Serie del Caribe al dirigirse al Hotel Venetur y protestar por la presencia del equipo de béisbol cubano Villa Clara", dijo Izarra en un mensaje. "No permitiremos que el fascismo empañe el buen desempeño de la actividad deportiva ni perturbe La Paz", agregó en otro tuit. Los cubanos, después de una ausencia de más de medio siglo, debutaron el sábado con una derrota 9-4 ante México. El domingo enfrentaban a Venezuela en la segunda fecha del torneo. Cuba es país fundador del certamen. Fue huésped y ganador de la primera edición en 1949 con los Alacranes del Almendares, y conquistó siete de las 12 primeras ediciones, llevándose el cetro con los Elefantes de Cienfuegos en 1960. Su participación terminó ese año cuando Fidel Castro prohibió el deporte profesional en la isla mayor de las Antillas. Venezuela y Cuba desarrollaron estrechas relaciones durante los 14 años del gobierno del fallecido presidente Hugo Chávez. Durante la administración del presidente Nicolás Maduro, quien asumió el gobierno en abril de 2013 tras ganar en los comicios presidenciales, los lazos entre los dos países se han mantenido. Venezuela envía al año más de 100.000 barriles de petróleo diarios a la isla en condiciones preferenciales, y a cambio recibe el apoyo de varios miles de cubanos que laboran en territorio venezolano en el área de salud, educación, y deporte. La oposición venezolana ha acusado a los dirigentes cubanos de ejercer influencia tras bambalinas en la orientación de las decisiones del gobierno y la fuerza armada. Los periodistas de AP en Caracas Jorge Rueda contribuyó a esta nota.